I have derived the following equations, which convert luminance factor to Munsell value with high accuracy – four correct digits after the decimal point. It is an improvement on the existing formula, proposed by McCamy, which has the maximum absolute error 0.0035. The range of V is [0; 10]. The range for Y is [0; 102.568]. The luminance factor is slightly higher than 100 because the reference white reflection was somewhat lower than that of the Munsell white color chip. The absolute error in these equations in less than 0.00005; the relative error is about 0.0002 (0.02%). This program is free software. It is distributed in the hope that it will be useful, but WITHOUT ANY WARRANTY; without even the implied warranty of MERCHANTABILITY or FITNESS FOR A PARTICULAR PURPOSE.
. C.S McCamy. Munsell Value as Explicit Functions of CIE Luminance Functor. Color Research and Applications, 17(3), 205-207 (1992).
. G. Wyszecki and W.S. Stiles. Color Science: Concepts and Methods, Quantitive data and Formulae, Second edition, John Wiley & Sons, 1982.
. ASTM Standard D 1535-08. 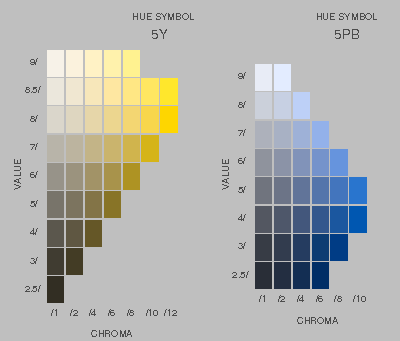 Standard Practice for Specifying Color by the Munsell System. American Society of the International Association for Testing and Materials, 2008.